We all want to be happy, healthy, hustlin’ babes with the habits to prove it, but it’s not always as easy as it looks. This week, our Advice Gurus chimed in on how to master (semi) healthy eating habits in the workplace. Read some, learn some, and leave us your questions for the next chapter of Asking For a Friend! When I'm not down with eating the same thing every day, I try to adjust my dinners to be enough for leftovers the next day. Typically I cook just for my boyfriend and I, but make sure to cook four portions worth. Alternately, I'm really into making a big casserole or soup on Sunday, for the whole week. I guess it's about the same, but to me putting together the same old combo of rice/quinoa, protein and veggie gets old. A yummy casserole that bakes it all together and cooks all at once is my best bet! I like to assemble, more than cook. My go-to quick and healthy lunch is some combination of the following stuff cut up, with a side of balsamic vinaigrette or other dressing and nutritional yeast: chicken sausage (so many different flavors! ), tomatoes, cucumbers, carrots. Whole Foods has awesome sides you can buy in bigger quantities too, like vegan mashed sweet potatoes, if you want something with more flavor or that can be served warm. I'm terrible at meal prep, but if I have this stuff on hand, I know I can make a quick and easy lunch. I try to make a big casserole for the week and use that every day. Spaghetti squash is great this time of year and there are so many delicious casserole recipes that incorporate it. Saying "40-hour work week" is usually an understatement. Often there are so many unaccounted for, after-work hours trying to finish up projects, or thinking about work, or stressing about it, or brainstorming. If it's possible in your role, try to set boundaries for yourself. In many jobs you can't avoid the 40-hour work week, but you can try to avoid all those extra hours. Turn off work email notifications when you're off. Allow yourself to jot down ideas on weekends, but wait until Monday to act on them. Be aware of and limit excessive "work talk." If you can, get used to sending those "I'll get back to you about this more on Monday" responses. It's important that when you do end those 40 hours, your brain clocks out from work, too. That usually helps make it easier to reset for the work week again. 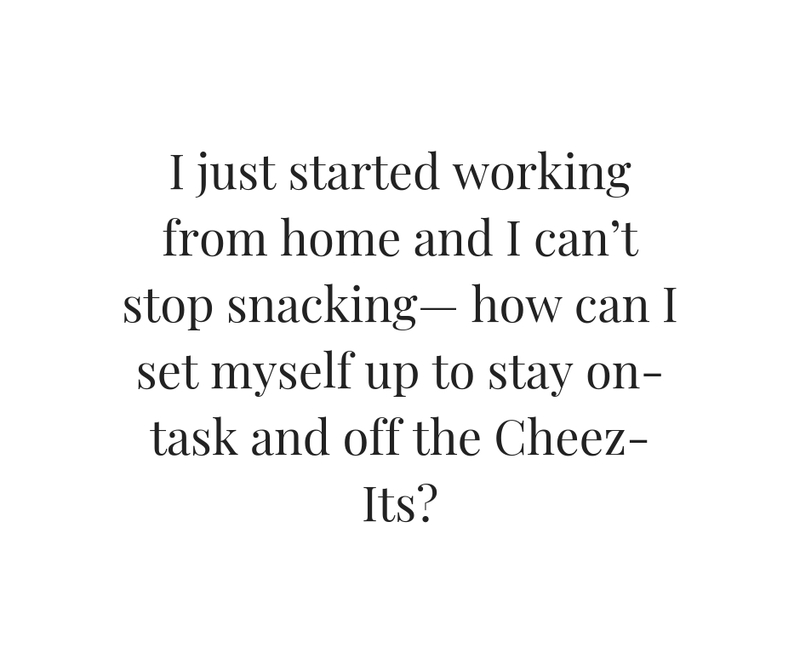 I personally snack less working from home than in an office, because every place I’ve worked had candy jars and leftover meeting food constantly. But I definitely get the pull to eat the way through the day, whatever the setting. If you have some flexibility, you could try working at coffee shops or libraries for a few hours each day to keep you away from the fridge. I try not to demonize food or certain eating patterns, because everyone is different. Maybe you just prefer small snacks instead of big meals. Or maybe there's an emotional element to consider. Do you feel more stressed, or lonely, or bored? Are you giving yourself a real lunch break and creating boundaries between work time and off time? Figure out why you’re snacking. If you just love grazing to keep your energy up, but want to eat more whole foods instead of processed ones, you could stock up on food that feels more nourishing to you and keep the processed stuff out of the house (or for special occasions). I'm just learning about it, but researching intuitive eating might provide a helpful framework for this life change. I try to have water and fruit on my desk when I'm working from home so I have the snacks I need handy. Also, I try to hide the snacks in a higher cabinet so I'm deterred from getting up and being distracted.